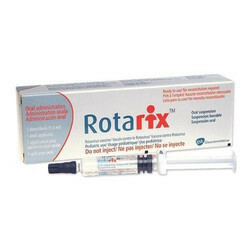 Offering you a complete choice of products which include rotarix vaccine. It is a vaccine indicated for the prevention of rotavirus gastroenteritis caused by G1 and non-G1 types (G3, G4, and G9) when administered as a 2-dose series. It is approved for use in infants 6 weeks to 24 weeks of age. Contraindications for Rotarix include a history of any of the following: hypersensitivity to the vaccine or any component of the vaccine, intussusception, uncorrected congenital malformation of the gastrointestinal tract that would predispose the infant to intussusception, or Severe Combined Immunodeficiency Disease (SCID). The tip caps of the prefilled oral applicators of diluent contain natural rubber latex, which may cause allergic reactions. Administration in infants suffering from acute diarrhea or vomiting should be delayed. Safety and effectiveness in infants with chronic gastrointestinal disorders have not been evaluated. Safety and effectiveness in infants with known primary or secondary immunodeficiencies have not been established. A study conducted after approval of Rotarix showed an increased risk of intussusception in the 31 days after the first dose of Rotarix, especially in the first 7 days. In other reports, an increased risk of intussusception has been observed within 7 days after dose 2. In clinical studies, common adverse reactions in infants receiving Rotarix included fussiness/irritability, cough/runny nose, fever, loss of appetite, and vomiting. Vaccination with Rotarix may not result in protection in all vaccine recipients.